Later that day, in a town an hour or so away- a boy named Alex is working at a diner. In walks this woman who he has never seen before- and his life changes. She’s beautiful- and he could watch her for hours. But, she’s content to sit there, drink her coffee and look outside the window. What does one woman disappearing in one town and one woman appearing mysteriously in another nearby town have to do with one another? In the hands of Mary Kubica- plenty. 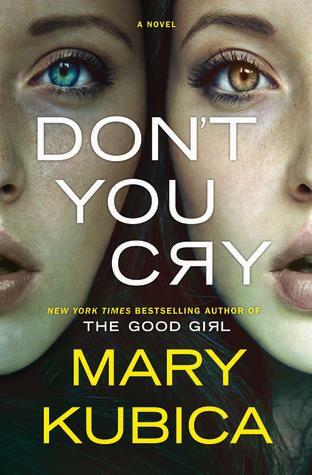 Having enjoyed both of Mary’s previous books (The Good Girl and Pretty Baby) requesting a copy of Don’t You Cry was like a total no-brainer for me. I thought I had the story figured out pretty early. I was wrong. Is Don’t You Cry better than Mary’s previous books? I don’t want to say yes and set your expectations TOO high- but Mary is like a fine wine, imo. She’s just getting better with age. You can tell she’s fine tuning her skill and while her skills were already pretty good- ain’t nothing wrong with some fine tuning. I could go on and on about this book- and tell you all the reasons why you should read it- it’s that good, you’re missing out on a thriller if you don’t read it, you don’t want to be the only person on social media NOT talking about this book- but I’ll refrain. In Don’t You Cry- nothing is as it appears. And that’s why it’s so damn delicious. *This book was sent to Traveling With T for review consideration. Don’t You Cry is also a April-June 2016 Futuristic Friday selection. I haven’t read any Mary Kubica yet, but I keep hearing about her! Should I start with her new one or start at the beginning? Her books are standalones, so you won’t get spoiled. I like them all, but I think she gets a bit better with each book. Check out Don’t You Cry first!